HF and Elizabeth Ride (ER) New information in red. The article 1941 Report – Future Control and Development of the Port Of Hong Kong mentions the Socony-Vacuum Oil Company. 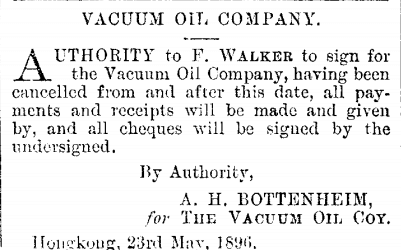 The first Hong Kong mention I can find is about the Vacuum Oil Company from The Hongkong Government Gazette of 23rd May 1896. WW2 in HK “As with many other oil companies at the time Socony-Vacuum tankers were recruited to transport oil for the Allies during World War 2. This caused a temporary drop in business and expansion overseas. Socony-Vacuum employed special transport companies in Hong Kong and Canada during the war to oversee the transport of their American products through war zones and dangerous ports”. Certainly not during the Japanese occupation of HK Dec 1941 – Aug 1945 so if this statement is true it must refer to pre Dec 1941 – more information about this would be useful. In 1946 the Standard Vacuum Oil Company had an office in the Hung Long Bank Building (address?). 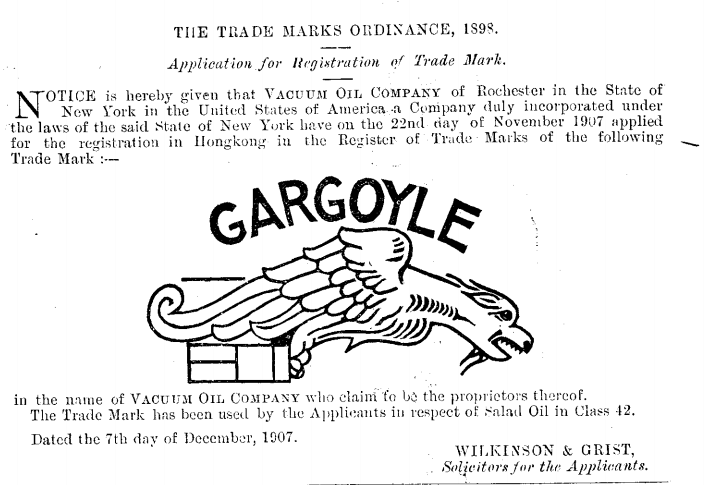 General History – Vacuum Oil Company was an American oil company known for their Gargoyle 600-W Steam Cylinder Oil. Vacuum Oil merged with Standard Oil Co of New York, commonly known as Socony Oil to form the Socony- Vacuum Oil Company. Vacuum Oil was founded in 1866 by Matthew Ewing and Hiram Bond Everest of Rochester, New York state. The lubrication oil was an accidental discovery while attempting to distil kerosene Everest noted that the residue from the extraction was suitable as a lubricant. Soon after, the product became popular for use in steam engines and the internal-combustion engines. Ewing sold his interest to Everest, who carried on the company. Vacuum was bought by Standard Oil in 1879. It originated the Mobil trademark in 1899. When Standard Oil was broken up in 1911 due to the Sherman Antitrust Act, Vacuum became an independent company again. Vacuum Oil and Standard Oil of New York merged in 1931, after the government gave up attempts to prevent it. The union, as Socony-Vacuum Corp., made them the third largest (at the time) world oil company. Everest was given a salary job as President and remained with the company. In 1955, the company became Socony Mobil Oil Company. In 1963 it was renamed Mobilgas then just Mobil. Exxon Mobil Corp. was formed in 1999 by the merger of Exxon and Mobil. This article was first posted on 26th July 2014. “Socony Oil Installation, Laichikok. This is now known as the Kawakami Oil Company Factory (Japanese characters). Three oil tanks are still standing, but are empty. There are over 300 50-gallon drums of petrol and kerosene in camouflaged dugouts in the area”. Best regards, EMR. This appears to be the office building for the Vacuum Oil company in 1936/7 in Hong Kong. See the sign on the building on the right side of this snap shot by Alice Joy Campbell.